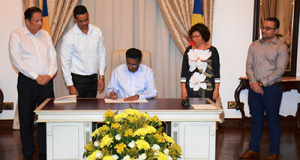 Seychelles will soon welcome its 10th Catholic Bishop, one hundred and sixty three years after the Seychelles Islands were erected into an Apostolic Prefecture. TONY MATHIOT remembers our first Catholic Bishop. The sad news arrived in the colony instantly – and on Friday January 7, 1910, the SEYCHELLES GOVERNMENT GAZETTE published an official notice from Governor Walter Edward Davidson (1859-1923) announcing the death of Right Reverend Marc Michel Hudrisier, on January 6, Bishop of Port Victoria, at the age of 62 years. Thus, on Sunday 9, all the inhabitants on Mahé were informed by their Parish priests during mass. 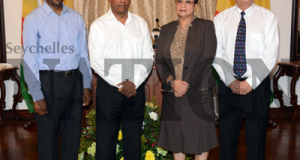 The younger folks must have had fond recollections of the man who had consolidated the doctrines of the Catholic Church in Seychelles for almost two decades. The older folks must have remembered him also as a young priest, some thirty years before. Marc Hudrisier was born on July 27, 1848 at Faverges. He entered the Franciscan Order in 1867 and was ordained priest on March 8, 1873. He arrived in Seychelles in 1875 when the Catholic Mission was an Apostolic Prefecture headed by Ignace Galfione (1815-1881). He stayed on Mahé for a few years where, with the typical brazen spirit of the 19th century missionary, he travelled to all those remote communities, sowing the seeds of Christianity among the inhabitants, more than a few of whom were former slaves. There were few district schools and less than half of the number of Parishes had been established. The young priest who was in his early 20s laboured assiduously. Transferred to Northern India, he acted as chaplain to the forces at Lahore, rector of the college of St. Thomas, superior of the mission at Agra which is a city on the Jumna River in Uttar Pradesh, the site of the Taj Mahal. 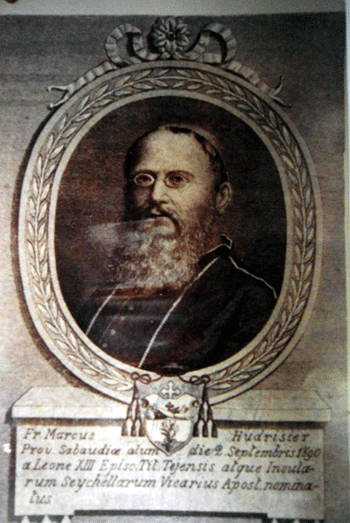 Later, he was the Vicar general of Mgr Symphorien Mouard (1828-1890) who was then Bishop of Lahore (Pakistan). It was while he was there that the Afghan War of 1879-1880 broke out. In July of 1880, British forces clashed with the advancing army of Ayub Khan from Herat who saw himself as the rightful ruler of Afghanistan which was ruled alternately by foreign empires and local emirs and kings until the 18th century. The British was the greatest military power in India. To repel Russian infiltration from across central Asia, Afghanistan was seen as an indispensable ally. This strategic advantage was achieved by installing Abdurrahman Khan as Amir. The British suffered heavy losses and had to retreat to Kandahar where, a few days later, they were besieged by Ayub and his generals. A rescue mission was hastily planned. This entailed a long arduous march from Kabul to Kandahar by general Frederick Sleigh Roberts (1832-1919) and his regiments. Marc Hudrisier was among those troops of 10,000 soldiers and 8,000 followers who left Kabul on August 7 and made that long route through the fertile Logar Valley to the city of Ghazni onto stony open plains where the marching mass had to reckon with dust, heat and sand storms. They travelled 320 miles in 23 days and arrived at the Kandahar Citadel on August 30. On September 1, Ayub Khan and his hordes of fighters were defeated. From 1863, missionaries of the Savoy Mission had been sent to Seychelles. Mgr Hudrisier must have felt elated at seeing the ones that awaited him: Father Philibert Meynet (1841-1903), Father Jean Damascene (1849-1920), Father Callixte Cachon (1841-1907), Father Ange Favre (1848-1924), Father Bonaventure Suatton (1835-1902), Father Jacque-Marie and Father Joseph Celestin d’Albertville (1844-1895). With his annual salary of R3,000.00 and his indefatigable spirit, Mgr Hudrisier began the task of rebuilding churches and presbyteries. On March 2, 1891, the Government School opened, which provoked indignation from the Catholic Clergy who fulminated against it from the sanctuary of their altars. Mgr Hudrisier did not let this matter divert him from his apostolic priorities. On July 14, 1892, Pope Leo XIII (1810-1903) elevated the Vicariat Apostolic to a diocese and Marc Hudrisier became the first titular bishop of Port Victoria. He initiated the construction of the Cathedral of the Immaculate Conception on the same site at La Rosière, where in 1854 Father Jeremie Giantommaso (1820-1871) who was then Prefect Apostolic had constructed the chapel. A belfry was erected on a hillock behind the Cathedral. A separate residence was also built for the bishop. On September 19, 1895, Mgr Hudrisier conferred holy orders on Father Jerome Pattoret (1872-1952). It was the first sacerdotal Ordination ever to take place in Seychelles. During that same year, Griffith left and was succeeded by Henry Cockburn Stewart (1843-1899) with whom Mgr Hudrisier enjoyed a good solidarity. He also acquired three plots of land on behalf of the Catholic Mission. 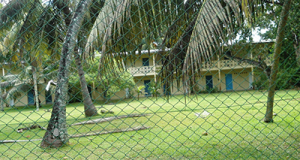 In fact, during Hudrisier’s episcopacy, the Catholic Mission gained eleven properties – acts of magnanimity from devout Catholic land owners who, no doubt, were anxiously eager to see the expansion of the Catholic Mission in Seychelles. The lands were used to build schools, churches and also to cultivate vanilla, cloves and vegetables. The plantations, notably those at Mare aux Cochons, Anse Major, Cap Ternay and Bel Ombre earned moderate revenue for the Mission and provided work for many men and women. In 1903, when Seychelles separated from Mauritius and became a colony, the bishop was among the many dignitaries who attended a levée when Ernest Bickham Sweet Escott (1857-1941) took his oaths as the First Governor of Seychelles on November 9, 1903. If it was a turning point in the history of the archipelago that brought many administrative advantages, it brought grim disenchantment to the Catholic Mission. It faced adversity from both the Government and the Anglican Church on various issues. During that same eventful year, Hudrisier travelled to Europe with hopes of finding priests who would be willing to serve their vocation under the equatorial sun. The provincial minister of Switzerland placed 2 priests at his disposal: Father Adrien Inhof (1868-1909) and Father Justin Gumy (1869-1941) who became bishop 1921-1934. Both were Swiss Capuchins. The bishop was greatly disappointed. He had hoped to obtain at least 16 missionaries! Both arrived in Seychelles in December 1903. In late September 1905, two more arrived: Father Gabriel-Marie Zelger (1867-1934) and Father Jeremie Luisier (1876-1956). At 57 years old, the bishop was beginning to feel the encroaching infirmities of health. Across the islands of Mahé, Praslin and La Digue, chapels and churches had sprung up like picturesque apostolic punctuation marks. The parishes were blooming and yet the Bishop felt in forma pauperis in a meadow of sparkling diamonds. In 1907, he left aboard SS Caledonien bound for Marseilles. He spent six months in France. Father Justin was appointed Vicar general on October 26, 1907. By then, 23 of the 27 grant-in-aid schools in the colony were controlled by the Roman Catholic Mission, and were attended by 2,250 pupils. 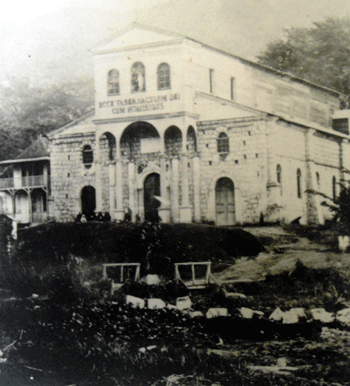 On May 5, 1908, Mgr Hudrisier blessed the Foundation Stone of St. Andrew Church at Cascade. It would be his last Episcopal function. Governor Walter Edward Davidson (1859-1923) knew that the ailing bishop had given the last ounce of his weakening strength. In April of 1909, when Mgr Hudrisier took a leave of absence to go abroad to recuperate, the Governor, who had a fond admiration for him was convinced that he would never return. On April 11, 1910 Bernardin Clark (1856-1915) was appointed the new bishop of Port Victoria. He was an Englishman. On March 9, 1908, Mgr Hudrisier had written “what is certain, is that after me, the Government will never allow the appointment of a non-English Bishop”.